The Z2S-DPU is a high performance digital force gauges that feature a separate sensor that is ideal for confined spaces or difficult to reach measurements. 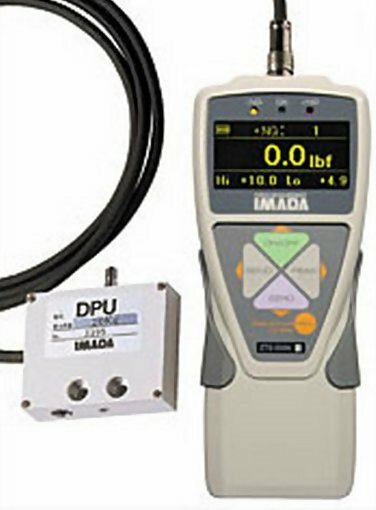 All standard DPU sensors are good for both compression and tension. A standard six foot cable connects the gauge to the sensor. The Z2S-DPU unit offers programmable high/low set points for go/no-go testing. ORANGE lights up for measurements less than Low set point, GREEN for between High and Low set point, and RED for over High setpoint.Store up to 1,000 values in memory, which can be displayed or transmitted using the RS-232C port. Use the real time mode to display load transients, or the peak mode to capture the peak force achieved during a test. Selectable measuring units of lbf, kgf, or Newtons.